I love this! Reminds me of Downwell. Oh man! Shooting the title screen is way too good! There is even audio! For the music I modified some of my old tracks to fit the loose retro/Amiga theme. Recycling your old stuff is not very jam-like behaviour but I'm happy that I found an opportunity to use those tracks somewhere. I hope there's nothing really messed up with the game at the moment (one annoyance was that xbox one controller started lagging but 360 controller works fine). I probably do some very minor updating sometime soonish (fixing weird graphics/adding details) but for now, I'm very happy with the jam result. This was just so pure and a joy to control! Art and sound seem cohesive, would never have guessed any of it was adapted after the fact. Dealing with the goats, discovered the trick of changing the angle of spectral blade mid slash for more area coverage; Love little control mastery details like this! The torch puzzle was a fun bite sized obstacle that took just the right amount of trial and error to grok, (at first I thought maybe I needed to corpse juggle the ghosts into the door or something). High impact death effects combined with generous checkpointing: Yes, please! "Corpse juggle the ghosts!" Well there's a tagline for my game! Thanks for the nice observations. Super extreme! I don't know how you are so good. Everything just looks, sounds, feels great! And just like effortlessly fluid. I missed the controls screen cuz I'm dumb and it took me several tries to beat the boss (I didn't know you could hit upwards!). I see from the gif that you can hit the title screen too. What an awesome detail! I liked that you put the enemy key at the end as well. It's important to know that all these guys are Thumbs refs in some way! That Drifter's fireballs are OP, haha. This felt so slick, wow. Also, I'm dumb and I never touch the right shift button in games so I was trying to use the left one and feeling frustrated. Very slick and pleasant to play. Super hard tho. I died like 10 times before getting past the first cannonball guy, and got stuck on the last room, thinking it was simply unfinished until I came back here and read Xeneth's spoiler. Yeah, short but sweet! This game is pretty amazing. I can't believe you put it to gether in 2 weeks! Really slick movement and interaction. 9/10. you loose one mark because goats are assholes. 9.5/10. Minus .5 because dibs doesn't like the goats. I could see this becoming something you could speed run. Have you considered making, or have you ever made, a full game? Cause you are good at making games. I simply love this game. Especially juggling a goat all the way across the screen... Maybe I can juggle it all the way to the end? This is a very polished and real (if short) game. I thought you had to light the candles with ghost corpses, so I wasted a lot of time trying to juggle ghosts past them. This is excellent! You're getting a lot of mileage out of this wizard character. As always, I hope you'll continue putting polish on this jam game. Like the ending screen says, Thank you for playing! 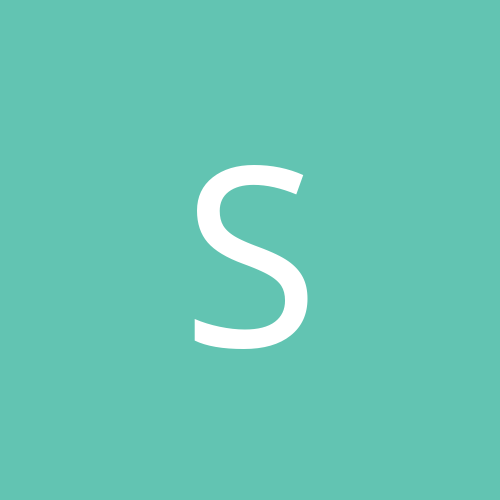 Your comments have been very rewarding after staring at sprites and code for two weeks. Thank you for such extreme compliments! I really like games that allow the player to go very fast if they want to test their skills, so there's a speedrun timer now in the game (for a brief moment we even discussed some speedrun strats in the jam slack!). My current best time is 25.71 seconds - so it is quite short. For some reason that's what I like to do in these jams: create a lot of different assets and stuff and then make a dense experience out of them. Even though most of the stuff I did in this project was already very familiar to me, it still was a great learning experience. So I'm now a little bit more confident in this stuff and hopefully soon start developing a bigger/non-jam game. 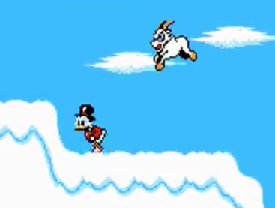 I blame Ducktales for giving me bouncy goat ideas. This is excellent! You're getting a lot of mileage out of this wizard character. Yeah, this could be seen as The Wizard III: The First Age of Extreme, sequel to The Wizard (from Introduction to Video Games) and The Wizard II: Dishonored Winter Solstice. The meter also has Nick Breckon's face next to it... 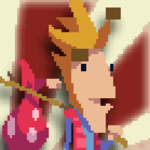 I hope Nick doesn't feel too weird about it, I deliberately made it just 32 by 28 pixels so it's a pretty indistinct fake facecam. Here's some sturdy gifs. Man, that internalization meter + webcam is so well implemented! George Stobbart approves of the goat bullying scene. 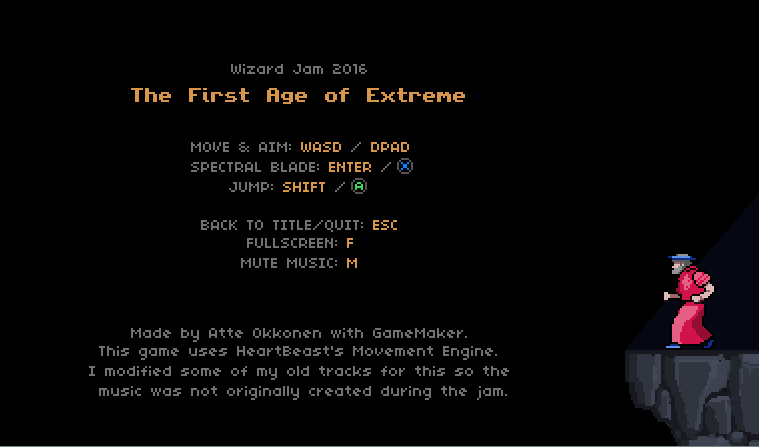 This is the Dark Souls of Wizard Jam. Seriously though, Love the art the music and the tough game design, tough but beatable. Such a valuable five minutes of gaming. Great to see you progress so far since your last jam game (iirc) - tighter design all round, looks and sounds even better. Loved the webcam and all the other little touches, and the puzzle and eogb were pitched just right. Excellent work as usual, atte! Beautiful art and hilarious Nick-cam implementation. This game was really good! I loved the art and sounds, and all the little flourishes. Nicely done! Love the artwork! Must admit I spammed the attack a bit though; maybe include a limit on the attack rate. Sorry I'm catching up on the Wizard Jam stream so late, but oh my god that webcam blew me away. 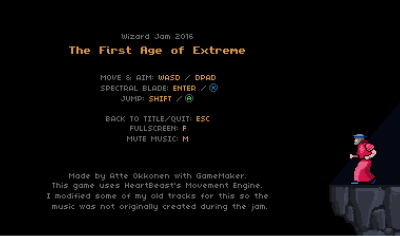 The wizard jam is a volcano eruption of ideas that I sincerely hope survive and go on to live powerful and famous lives. Also: I've played Shadow of the Beast and Altered Beast, and I easily believe you could top those at their own game if you wanted to pursue it. Really nice work on the game overall.